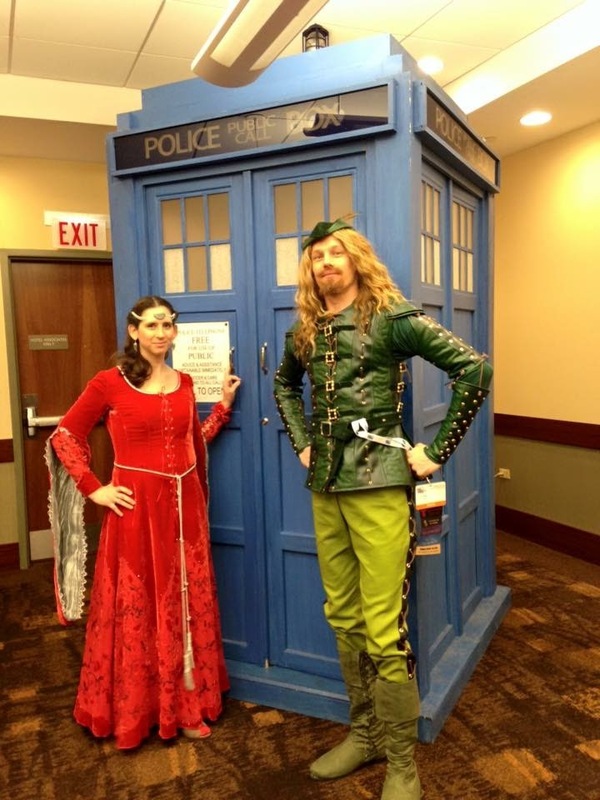 As soon as my wife and I saw the Robin Hood episode of Doctor Who, we knew we had to do Clara and Robin Hood for Chicago TARDIS. 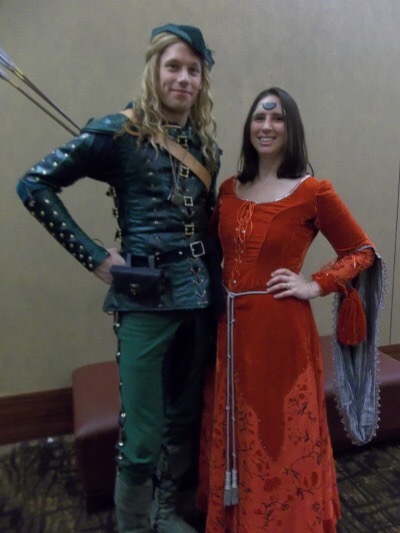 I would be able to use my Éomer wig, and since we planned this before I made Prince Caspian, I was able to get all the vinyl for both costumes at the same time in one big roll. 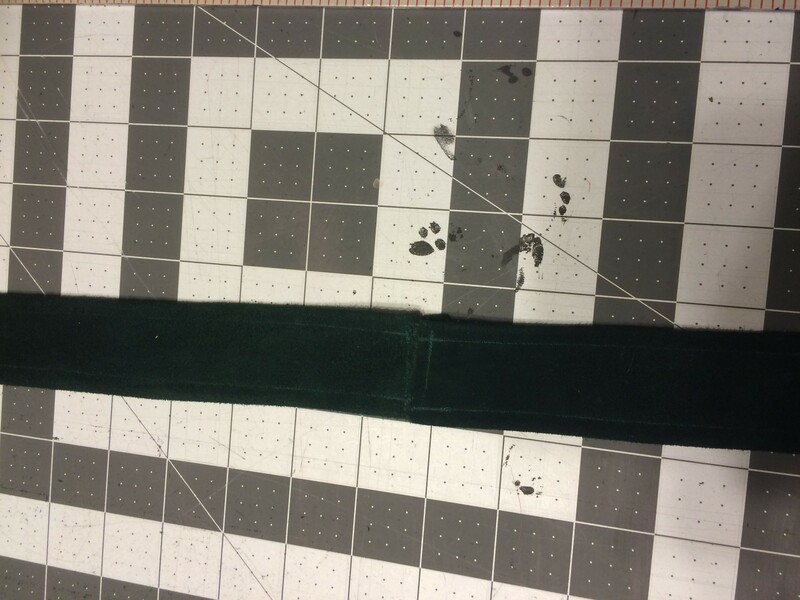 Test pieces – figuring out quilting, piping, eyelets, and color. 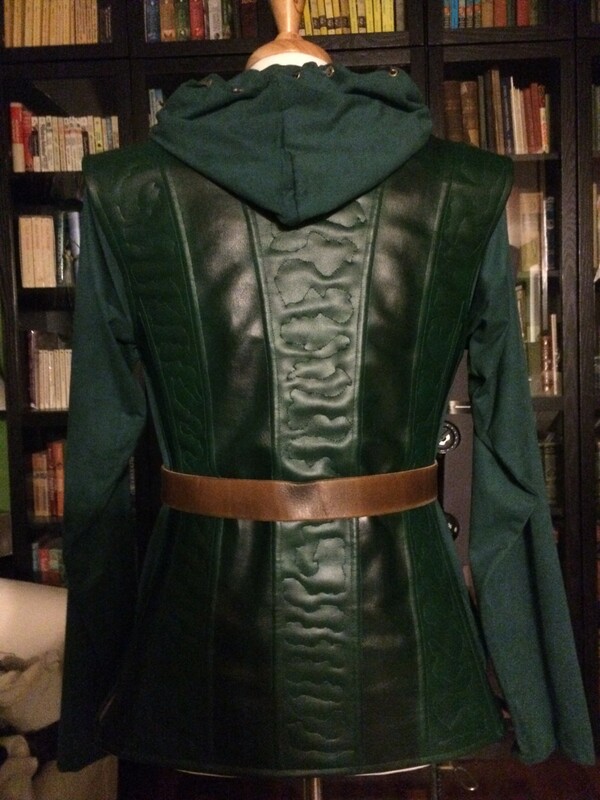 Lynette got a head-start in August, and made the hoodie (partially documented on her site) and prototype trousers. I didn’t start on the rest until October 24th – approximately one month before the convention. 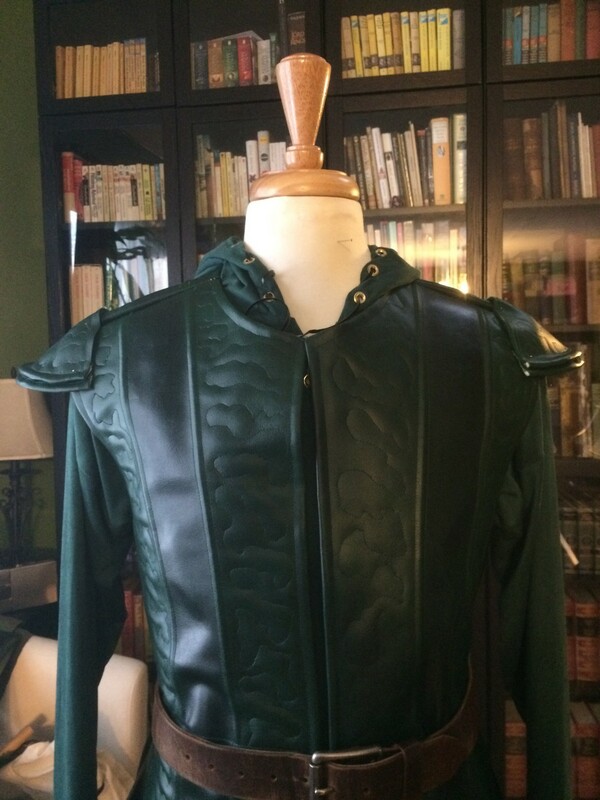 Robin Hood’s jerkin/sleeves appear to use two different colors and textures of leather, but I found I could approximate the color difference by applying some water-based black leather dye to darken the green vinyl. 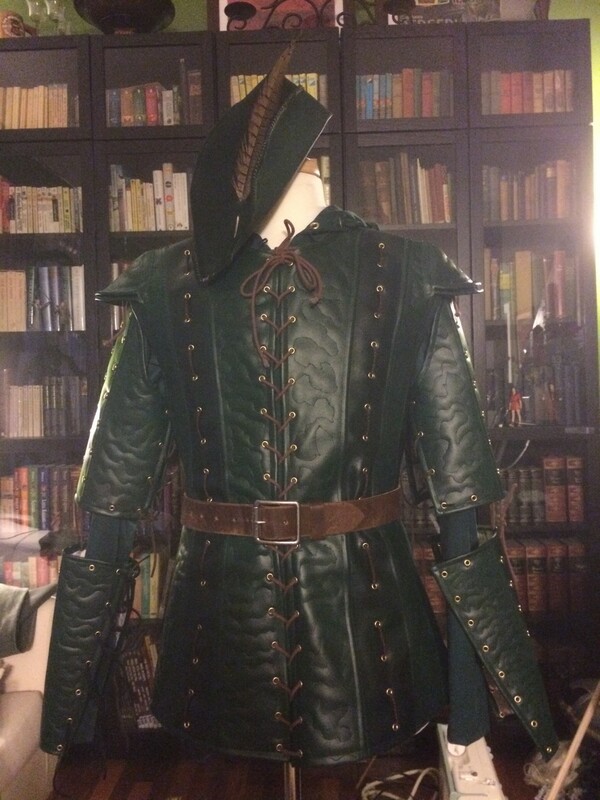 The darker parts of the real costume look like they might be ventilated leather like you would find in car upholstery. I’ll be living without that. 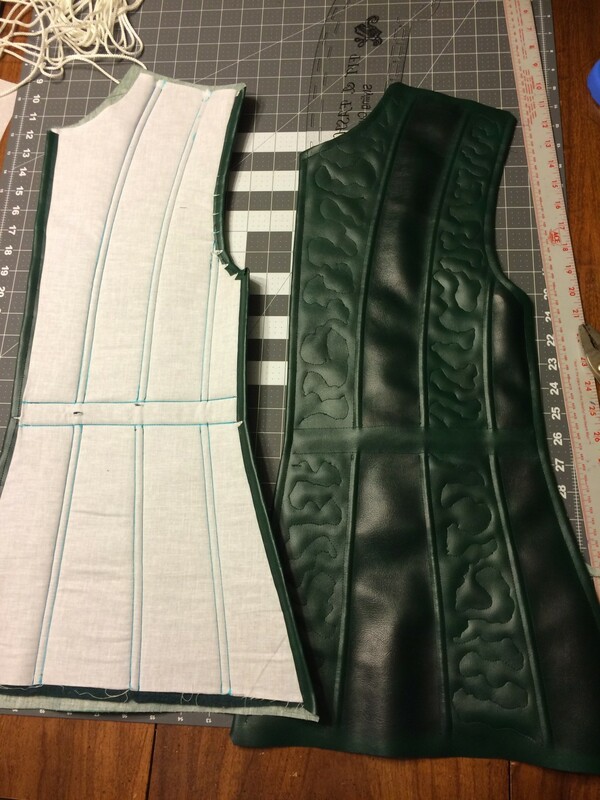 I think the contrast between the quilted and non-quilted portions will be enough for me. 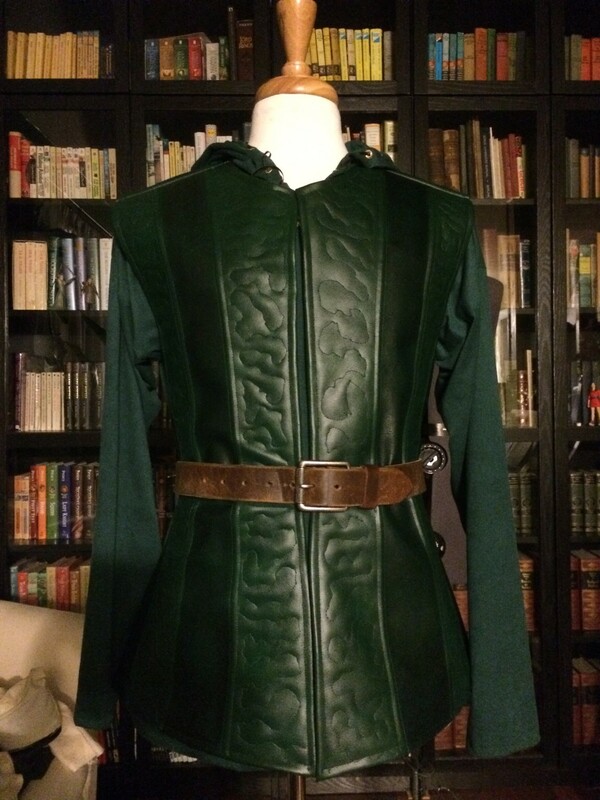 For the pattern, I used some of what I drafted for Caspian, but adjusted it based on what I learned wearing that for a weekend. 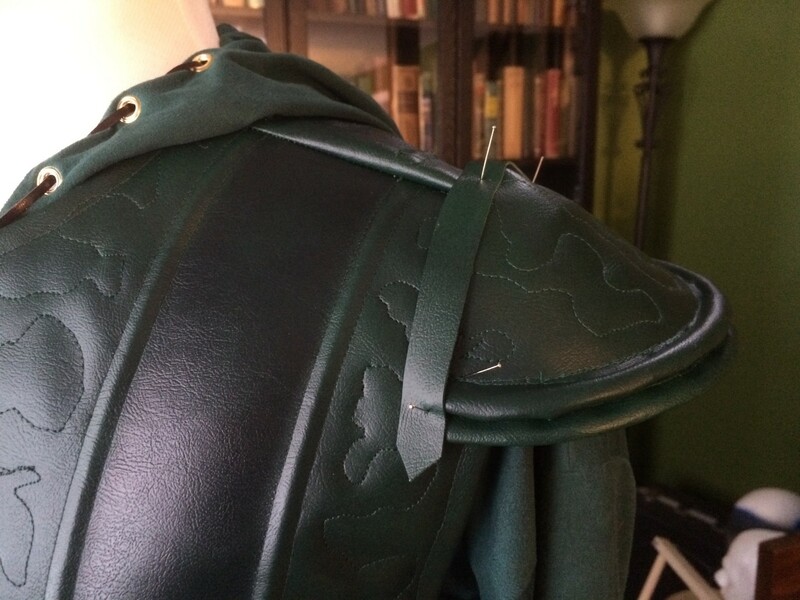 Mostly this involved narrowing the waist of the back piece. 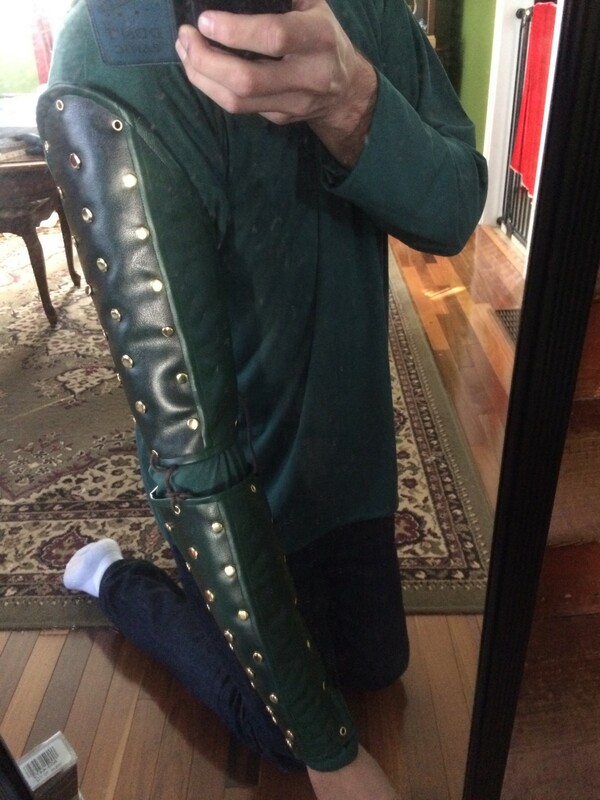 For the sleeve segments I simply measured around my wrist, forearm, and upper arm and drafted the patterns based on those measurements. 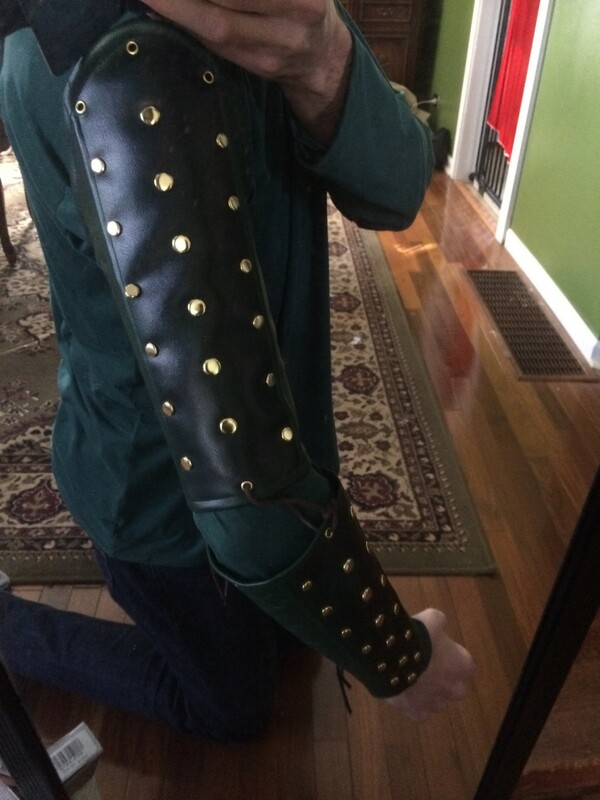 For the upper arms, I just freehanded a bell-curve like you would find on the top of a sleeve. 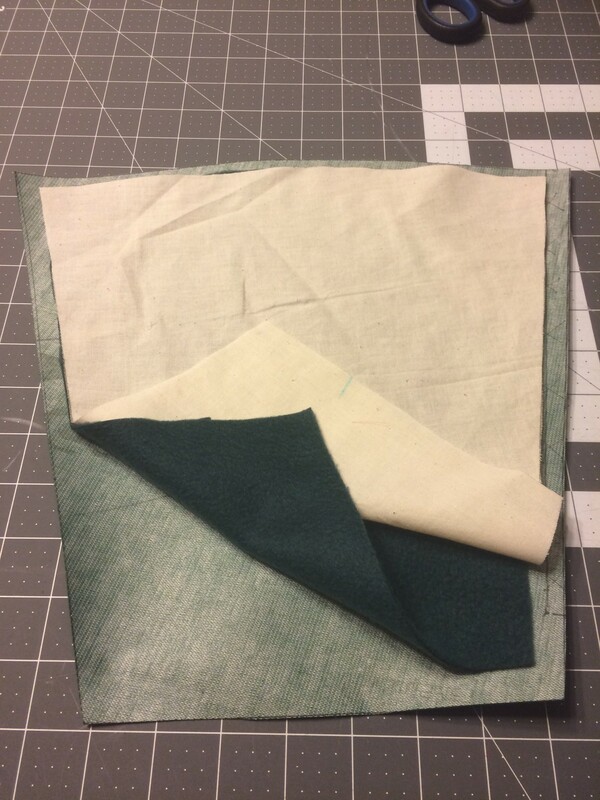 To achieve depth in the quilting, I’m building each costume piece in three layers: vinyl on top, fleece in the middle, and muslin backing. In my experiments, this gave plenty of dimension to the quilting – at least as much as I could see in reference shots. 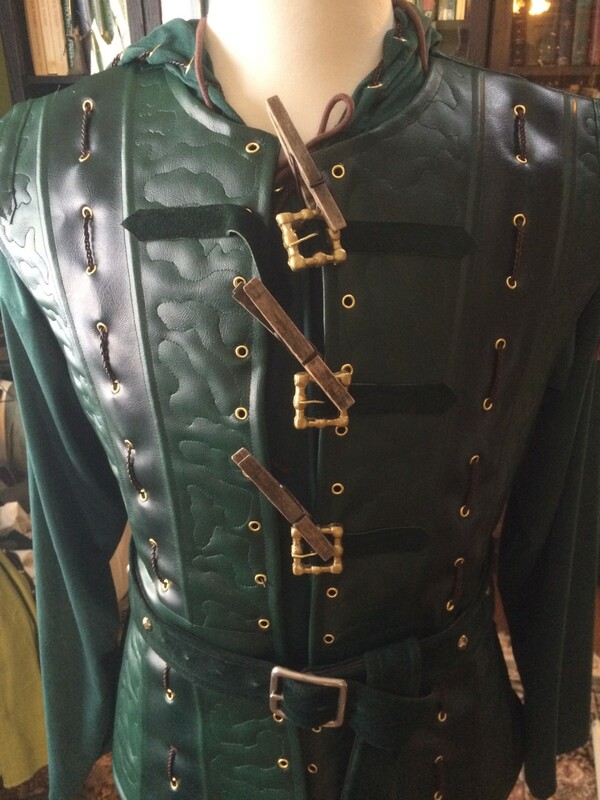 Another feature of the costume is lots of piping. I might have been able to get away with just top-stitching these and relying on the fleece to give it dimension, but I wanted them to really pop. 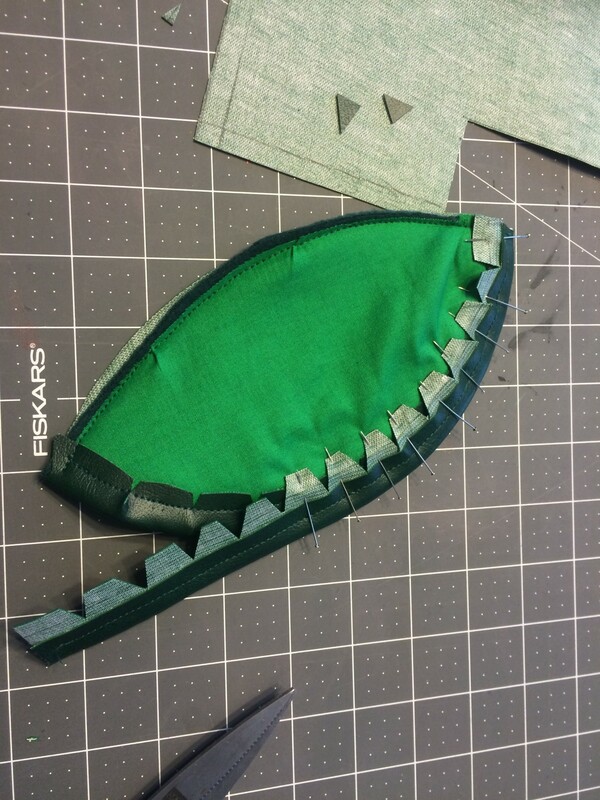 To make this happen, I first sewed each “sandwich” together only at the sides, leaving the top and bottom open. 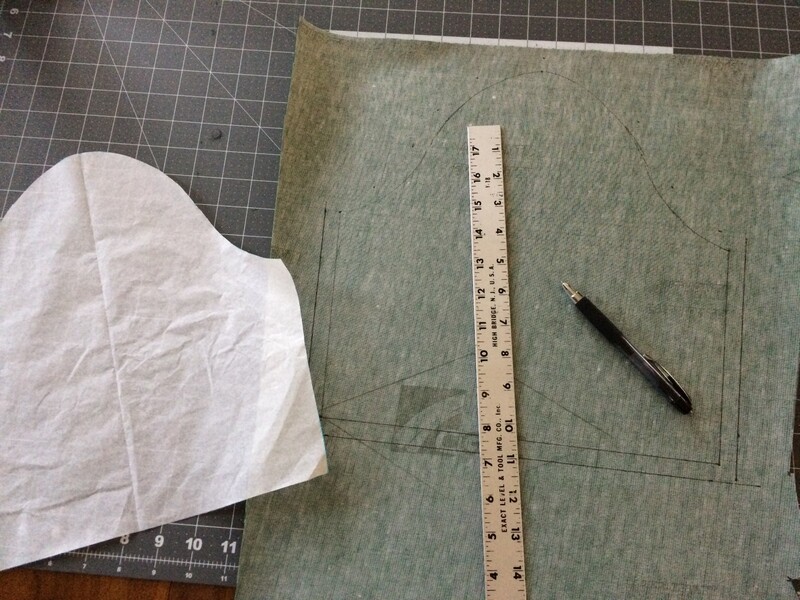 Then I marked my piping lines on the muslin and top-stitched each channel, again leaving the top and bottom open. Finally I used floral wire to pull a piece of 1/8″ cord (from Home Depot) through each channel. 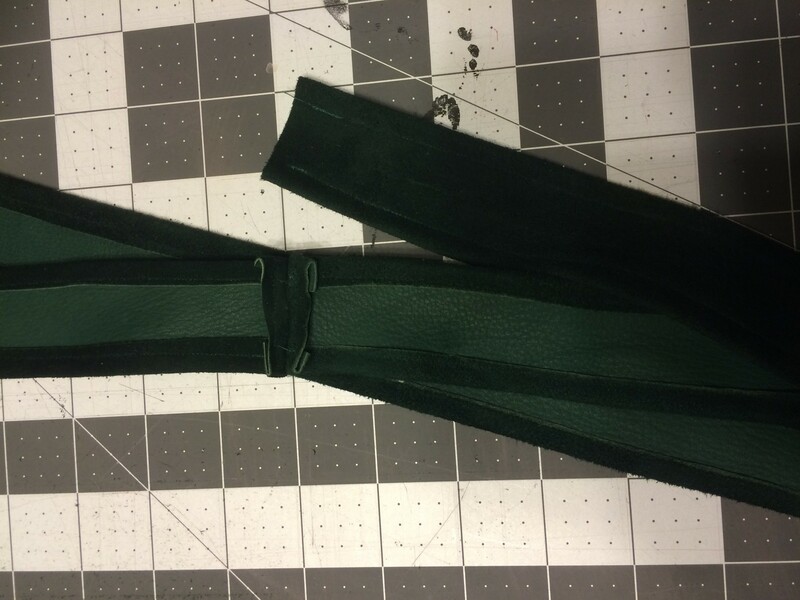 This was easy to do on the sleeve sections, and more difficult on the jerkin where the channels are longer and have curves. 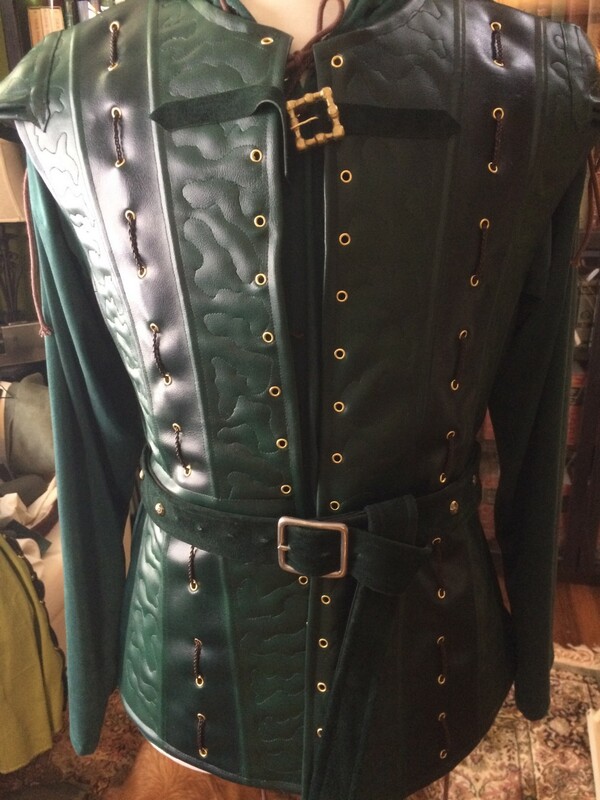 Another important element of this outfit is the multitude of eyelets and studs (rivets). 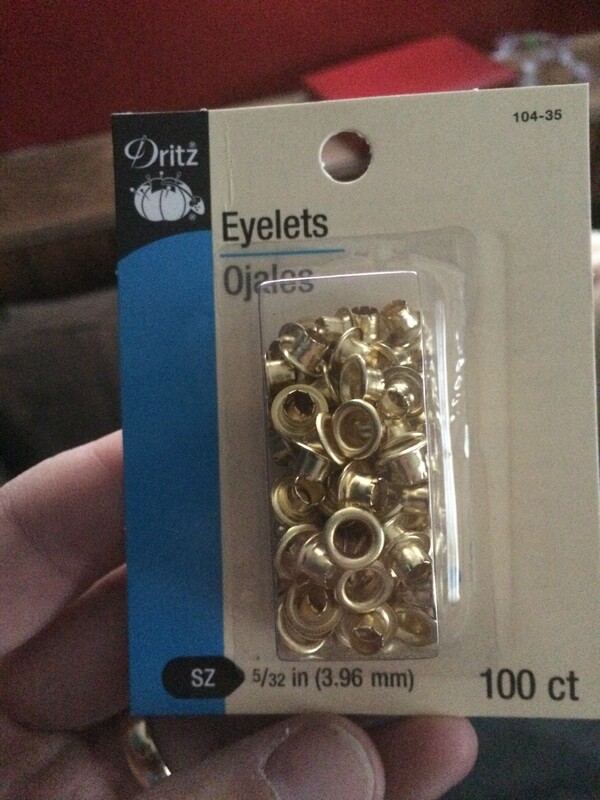 For the eyelets, I used the 5/32″ brass eyelets from Dritz. To attach them, I found the tool they provide to be a little unreliable unless I prepped the eyelets before using it, in the following way: I made my own awl by sharpening an old screwdriver that had become unusable. I just rotated the tip against the belt sander until it had a nice point. 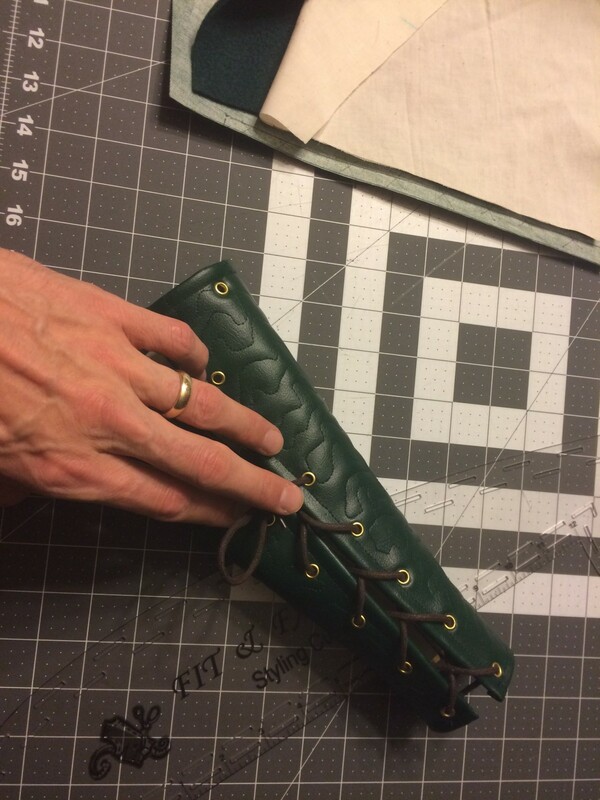 Then, each time I punctured the vinyl, I placed the eyelet onto the tip of the awl and pressed it down slightly. 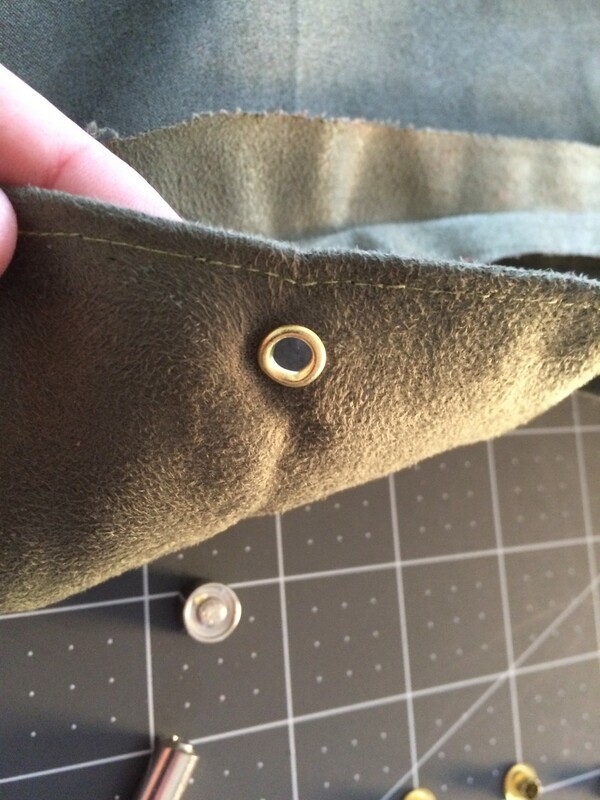 This flares the end of the eyelet just a little more, and makes using the eyelet tool much more reliable. 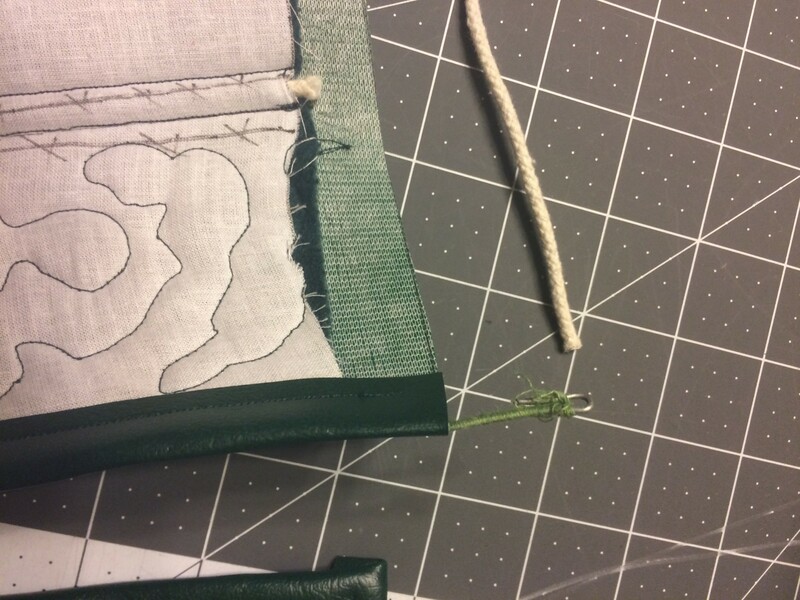 Since it’s now wider and harder to get through the fabric, I keep it on the end of the awl while I pull it back through the hole. 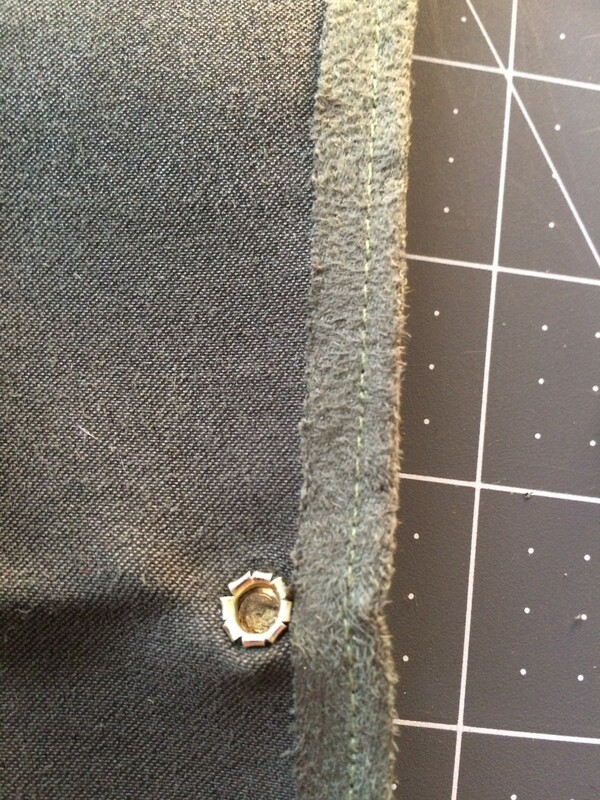 The awl keeps the hole open for the eyelet to pass through easily. For the studs I used two different sizes of brads from Office Depot. 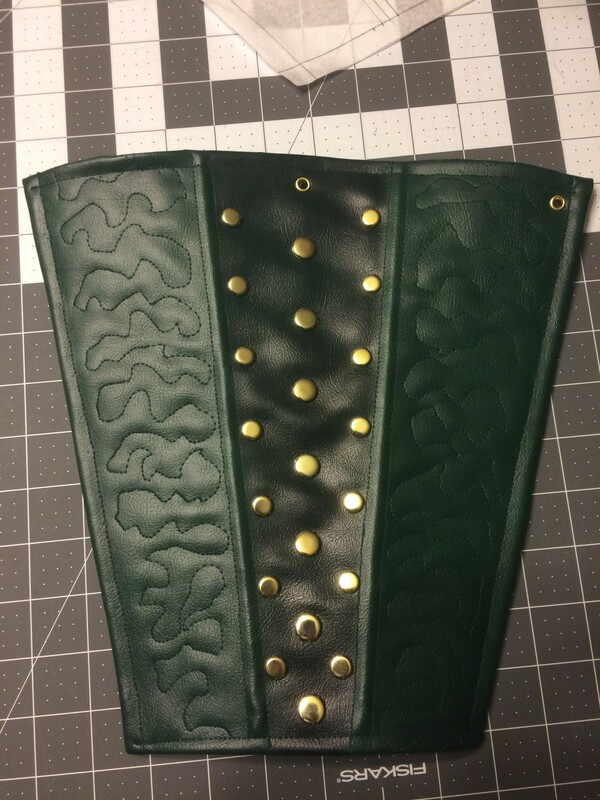 The brads create a little bit of chaos on the back of the sleeve pieces, but they are far easier (and easier to find) than using rivets or some other kind of stud. 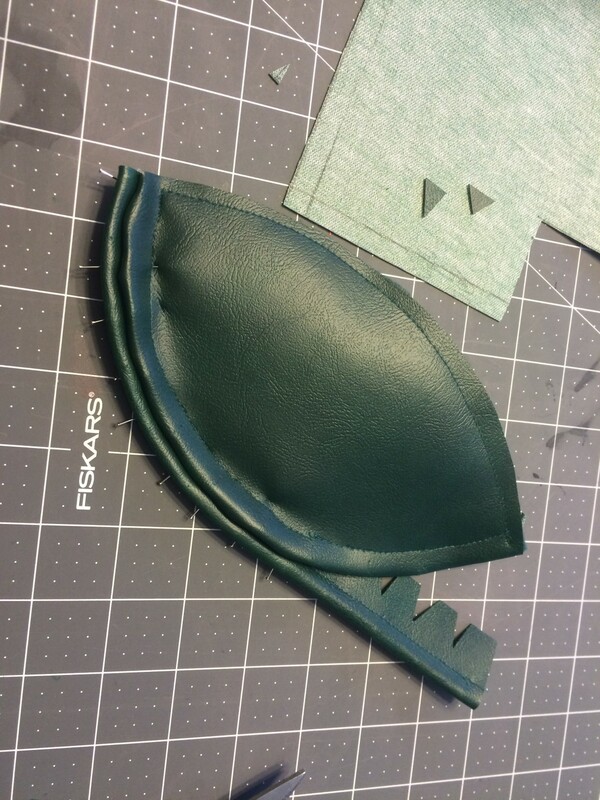 I may end up putting some kind of secondary backing to protect the brads from getting snagged and bent. 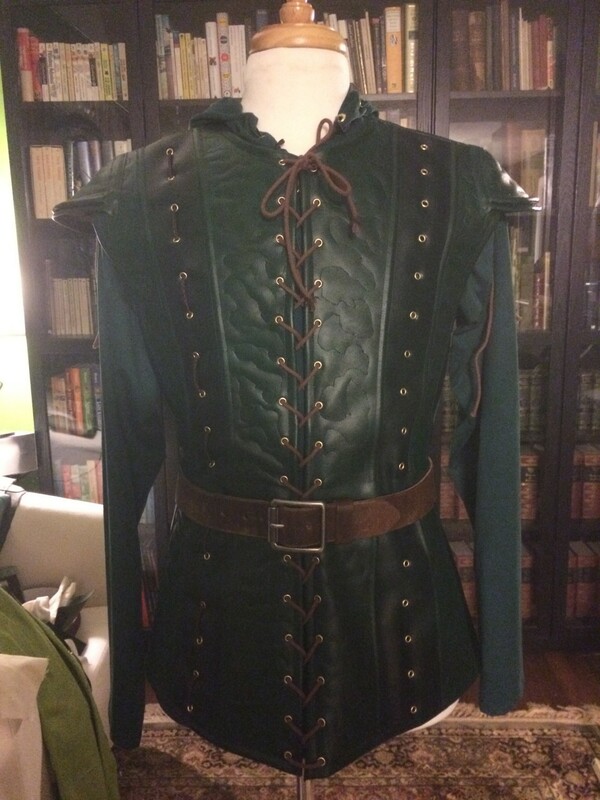 This costume uses a LOT of cord and lacing. 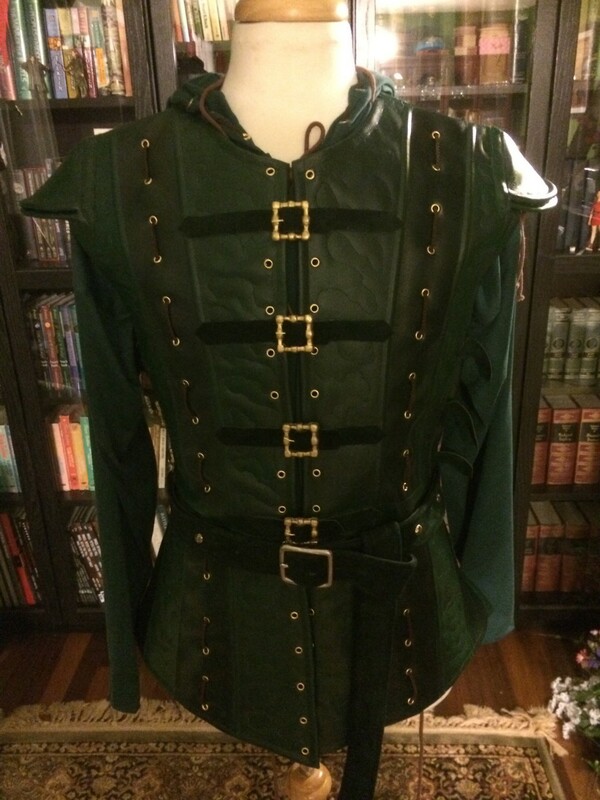 There are laces on the boots, both arm pieces (which also lace to each other), up the front of the jerkin, up each pant leg, then decorative braid down the front and back of the jerkin and around the hood. There are two distinct types used: leather braid and what appears to be brown cotton or nylon cord. For the braid, I got 1mm leather cord from Michael’s and braided it (3 strands). For the other laces, I got 3mm brown macrame cording from Amazon. The next thing I needed to do was figure out the shoulder-cap things. I thought they might be symmetrical football shapes, but it ended up working better to have them slightly asymmetrical, with the shorter side sewn to the jerkin and the longer side facing out and getting piping. 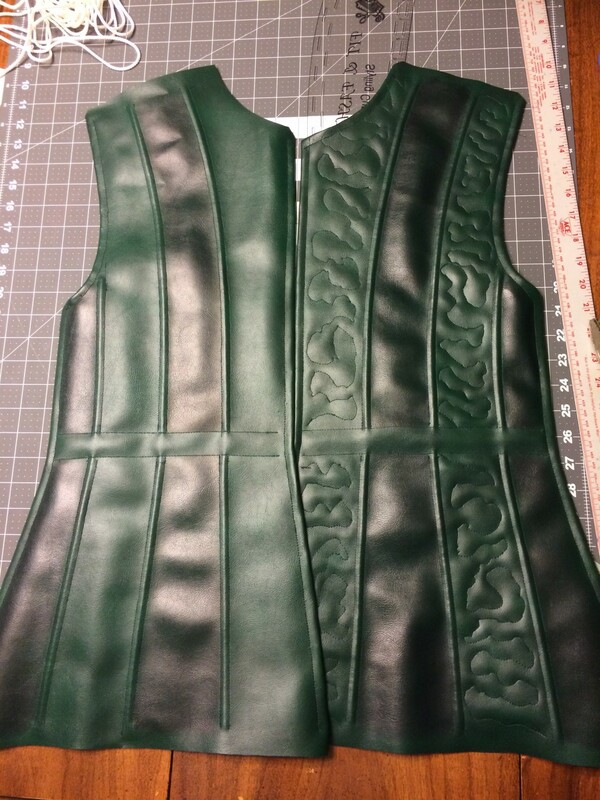 I also added a second layer of piping to match the reference shots. After sewing them onto the jerkin, they each got an extra strip to hide the raw edge, again matching what you see on-screen. 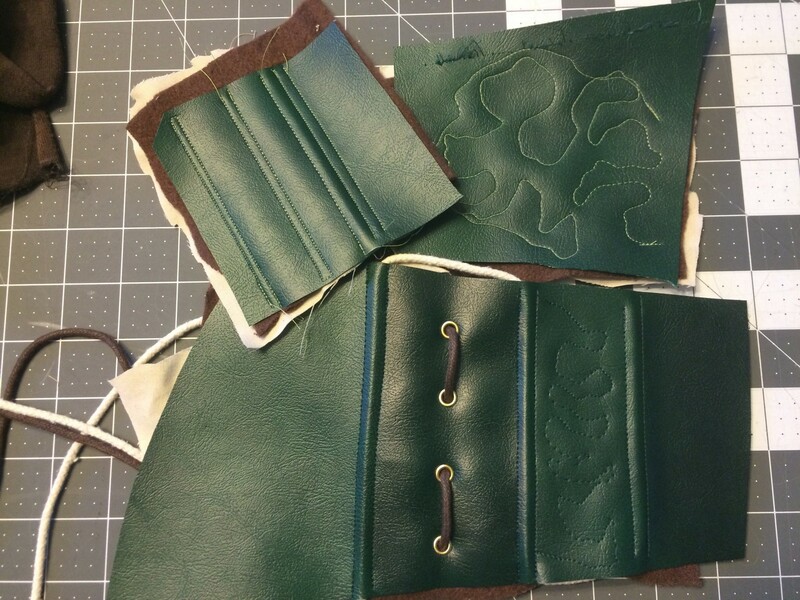 As the con got closer, I got worse about documentation, but in the above photos you can see the buckles I sculpted, molded, cast and painted. 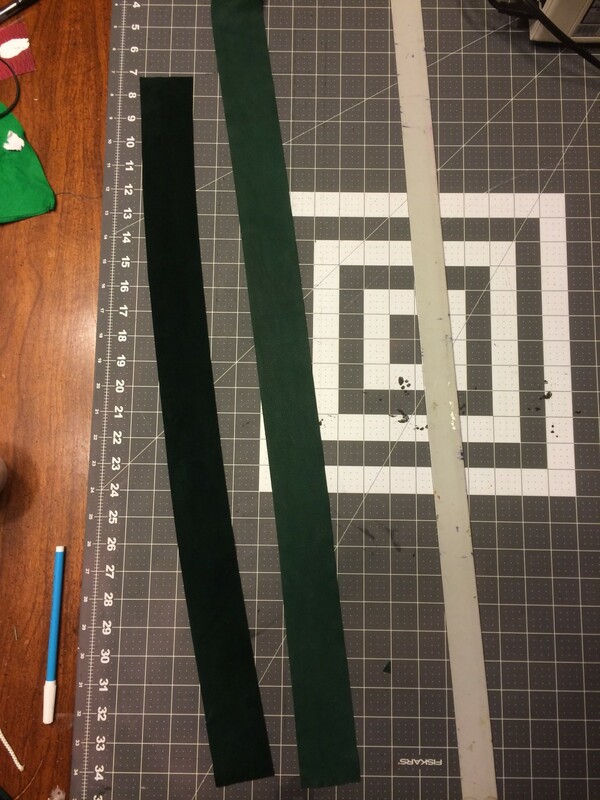 I used a piece of sueded green buckskin from ebay to make a hat, and used the leftovers to make a belt and all the straps. 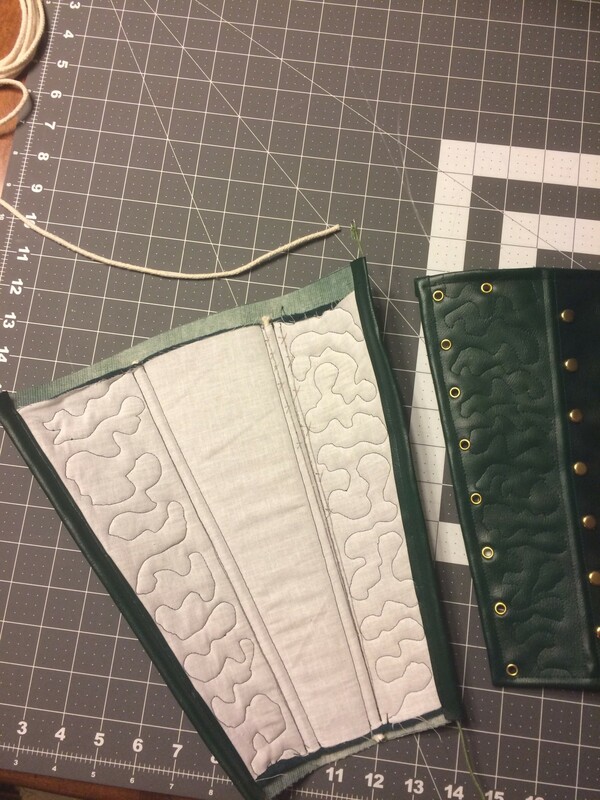 The belt got backed with some craft foam to give it a little more stiffness, but it still doesn’t support any weight/stress. At the last minute I threw together a bow carved from a $2.50 piece of pine from Home Depot, a quiver made from some foam, leftover boot fabric and a leather belt blank, and some repainted Queen Susan arrows. 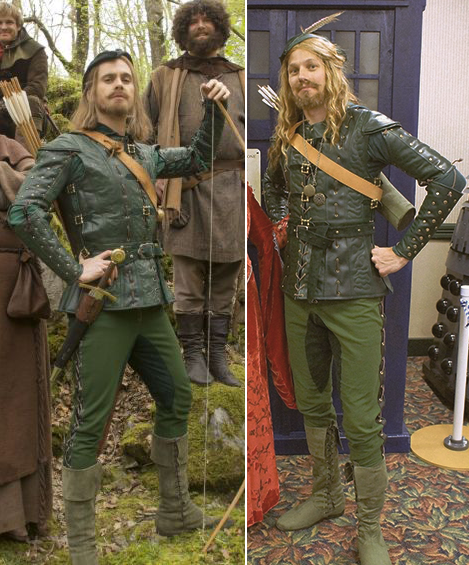 I also used my Éomer wig and some crepe hair for a beard/mustache. 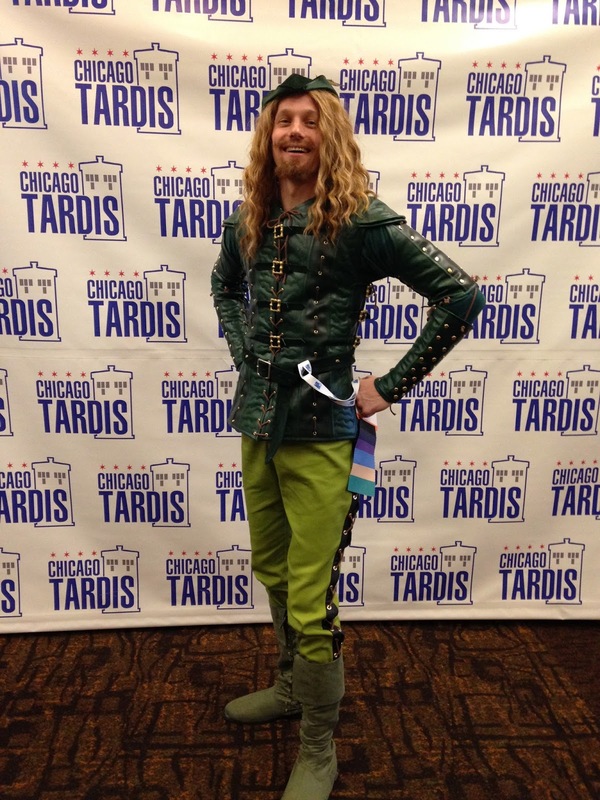 We debuted our costumes successfully at Chicago TARDIS 2015, taking home “Best in Show – Workmanship”. 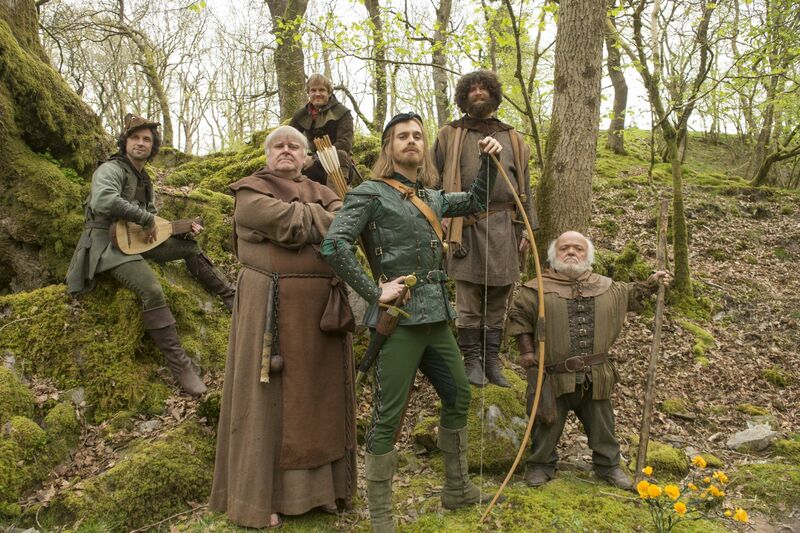 Unfortunately, I ended up wearing prototype trousers that neither of us were happy with, but we just ran out of time to make them better. 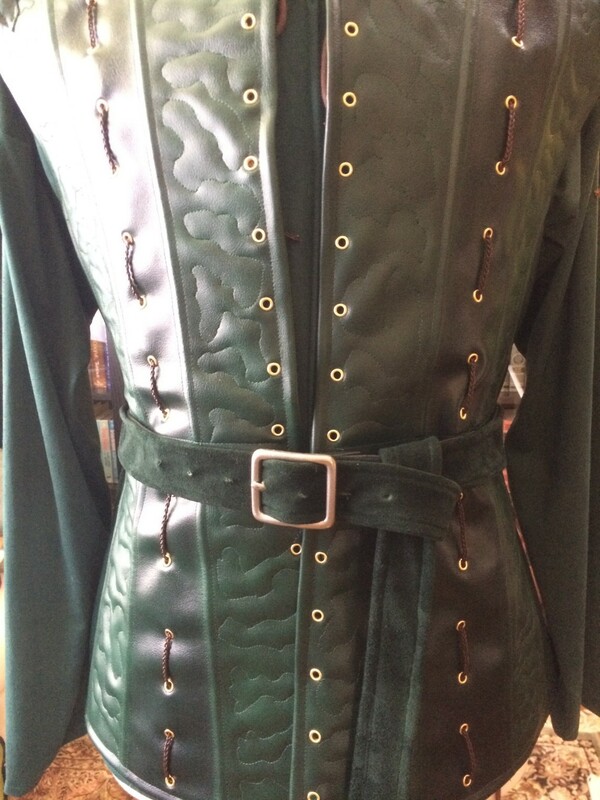 You can see in the finished pics that they are the wrong shade of green, but they still look pretty good! Better, non-iPhone pictures coming soon. 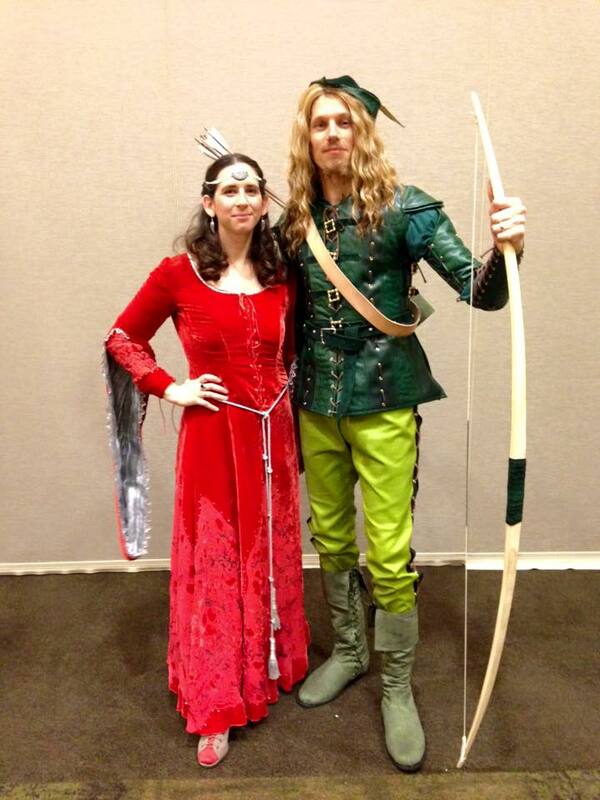 Update: In August 2016 – I made an updated pair of pants/leggings for DragonCon, although I didn’t end up wearing this costume at all that weekend. 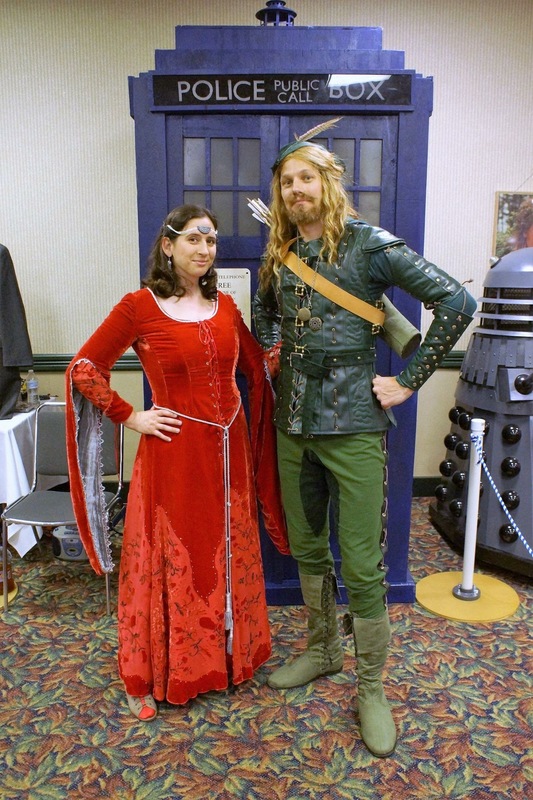 They finally debuted at Chicago TARDIS 2016, and then at Britishfest 2017.